Have Three Little Photons Broken Theoretical Physics? Artist’s impression of a gamma ray burst. Seven billion years ago, three cosmic travelers set out together on an epic journey to Earth. They just arrived, and the trio has a surprising tale to tell about the structure of the universe. Their story could overturn decades of work by theoretical physicists. But first, an introduction: Scientists have long wondered about the nature of space and time. Albert Einstein envisioned the two concepts as an interwoven fabric that extends smoothly and continuously throughout the universe, warping under the weight of the matter it contains. The smoothness of this stretchy "space-time" fabric means that no matter how closely one inspects it, no underlying structure emerges. The fabric is completely pure even at infinitesimal scales. The snag in this picture of a space-time fabric is that it doesn't jive with quantum mechanics, the set of laws describing the bizarre behavior of subatomic particles. To explain gravitational interactions between planets and stars, Einstein's theory works beautifully; but try to describe quarks or electrons zipping about on a fabric with no elemental structure, and the equations turn to nonsense. Modern "theories of everything" try to reconcile Einstein's big picture view of the universe, built of space-time, with the small-scale picture of the universe described by quantum mechanics. Most of these theories, collectively called "quantum gravity," posit that space-time must not be smooth after all, but must instead be comprised of discrete, invisibly small building blocks — sort of like 3D pixels, or what scientists have dubbed a "foam." But real or not, such space-time pixels seemed to be permanently out of human reach. For reasons having to do with the uncertainty that exists in the locations of particles, theories suggest the pixels should measure the size of the "Planck length," or about a billionth of a billionth of the diameter of an electron. With the key evidence for quantum gravity buried at such an inaccessible scale, physicists were at a loss for how to confirm or refute their ideas. Then, a paper published 15 years ago in the journal Nature proposed an ingenious method of detecting space-time pixels. Giovanni Amelino-Camelia, a theoretical physicist at Sapienza University in Rome, and colleagues said the building blocks of space-time could be discovered indirectly by observing the way light of different colors disperses as it travels through the pixels on its journey across the universe, just as light spreads into its component wavelengths when it passes through the crystalline structure of a prism. As long as one is sure all the photons, or particles of light, left their source at exactly the same time, measuring how much photons of different wavelengths spread out during their commute to Earth would reveal the presence, and size, of the pixels they passed through. Such studies hadn't been feasible, until now. Seven billion years ago, 7 billion light-years away, a gamma-ray burst sent a blitz of photons tearing into space. Some of them headed for Earth. Gamma-ray bursts occur when an extremely massive, rotating star collapses in on itself, unleashing in less than a minute as much energy as our sun will radiate in its entire 10-billion-year lifetime. These shockwaves of gamma rays and other energetic photons are the brightest events in the universe. When gamma ray bursts have occurred in the Milky Way galaxy, scientists speculate that they might have altered Earth's climate and induced mass extinctions. Thankfully, the bursts are so rare that they typically occur a safe distance away — far enough that only a light mist of photons reaches our planet. NASA's Fermi Gamma-ray Space Telescope was launched into orbit in 2008 to scan the skies for these mists of shockwaves past. Robert Nemiroff, an astrophysicist at Michigan Technological University, and colleagues recently took a look at data from a gamma-ray burst detected by the Fermi telescope in May 2009. "Originally we were looking for something else, but were struck when two of the highest energy photons from this detected gamma-ray burst appeared within a single millisecond," Nemiroff told Life's Little Mysteries. When the physicists looked at the data more closely, they found a third gamma ray photon within a millisecond of the other two. 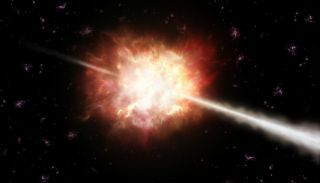 Computer models showed it was very unlikely that the photons would have been emitted by different gamma ray bursts, or the same burst at different times. Consequently, "it seemed very likely to us that these three photons traveled across much of the universe together without dispersing," Nemiroff said. Despite having slightly different energies (and thus, different wavelengths), the three photons stayed in extremely close company for the duration of their marathon trek to Earth. Many things — e.g. stars, interstellar dust — could have dispersed the photons. "But nothing that we know can un-disperse gamma-ray photons," Nemiroff said. "So we then conclude that these photons were not dispersed. So if they were not dispersed, then the universe left them alone. So if the universe was made of Planck-scale quantum foam, according to some theories, it would not have left these photons alone. So those types of Planck-scale quantum foams don't exist." In other words, the photons' near-simultaneous arrival indicates that space-time is smooth as Einstein suggested, rather than pixilated as modern theories require — at least down to slightly below the scale of the Planck length, a smaller scale than has ever been probed previously. The finding "comes close to proving [that space-time is smooth] for some range of parameters," Nemiroff said. "The analysis Nemiroff et al. are reporting is very nice and a striking confirmation that these studies of Planck-scale structure of space-time can be done, as some of us suggested long ago," said Amelino-Camelia, an originator of the idea that gamma rays could reveal the building blocks of space-time. "But the claim that their analysis is proving that space-time is 'smooth with Planck-scale accuracy' is rather naive." To prove that Planck-scale pixels don't exist, the researchers would have to rule out the possibility that the pixels dispersed the photons in ways that don't depend in a straightforward way on the photons' wavelengths, he said. The pixels could exert more subtle "quadratic" influences, for example, or could have an effect called birefringence that depends on the polarization of the light particles. Nemiroff and his colleagues would have to rule out those and other possibilities. To prove the photon trio wasn't a fluke, the results would then require independent confirmation; a second set of simultaneous gamma-ray photons with properties similar to the first must be observed. If all this is accomplished, Amelino-Camelia said, "at least for some approaches to the quantum-gravity problem, it will indeed be a case of going back to the drawing board." This story was provided by Life's Little Mysteries, a sister site to SPACE.com. Follow Natalie Wolchover on Twitter @nattyover or Life's Little Mysteries @llmysteries. We're also on Facebook & Google+.